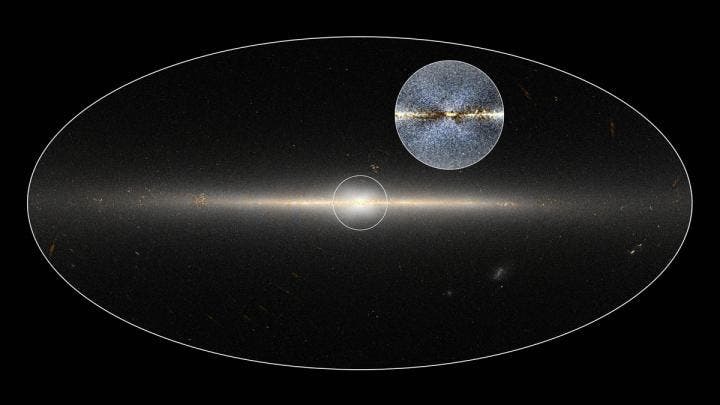 Is the structure the result of an ancient collision of the Milky Way with another galaxy? Previous computer models, observations of other galaxies, and observations of our own galaxy have suggested that the X-shaped structure existed. But no one had observed it directly; and some astronomers argued that previous research that pointed indirectly to the existence of the X could be explained in other ways. Now, Two astronomers have uncovered the strongest evidence yet that an enormous X-shaped structure made of stars lies within the central bulge of the galaxy. WISE allsky map of the sky below showing the Milky Way, with the central circle indicating the center of the Galaxy and the inset shows an enhanced view of the x-shaped structure. The Milky Way Galaxy is a barred spiral galaxy: a disk-shaped collection of dust, gas and billions of stars, 100,000 light-years in diameter. It is far from a simple disk structure, being comprised of two spiral arms, a bar-shaped feature that runs through its centre, and a central bulge of stars. The central bulge, like other barred galaxy’s bulges, resembles a rectangular box or peanut when viewed–as we view it — from within the plane of the galaxy. The X-shaped structure is an integral component of the bulge. Astronomers think the bulge could have formed in two different ways: it may have formed when the Milky Way Galaxy merged with other galaxies; or it may have formed without the help of external influences as an outgrowth of the bar, which itself forms from the evolving galactic disk. Lang and Ness’s finding supports the latter model which predicts the box- or peanut-shaped bulge and the galactic X. This latest, clearest view of the bulge emerged when Lang re-analyzed previously released data from the Wide-field Infrared Survey Explorer (WISE), a space telescope launched by NASA in 2009. 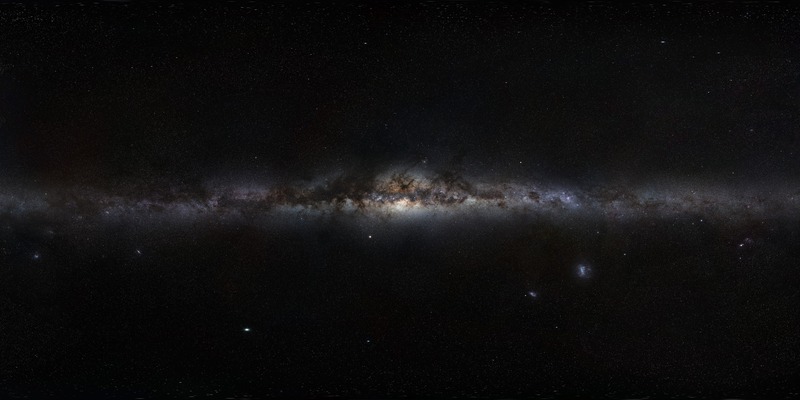 Before ending its initial mission in 2011, WISE surveyed the entire sky in infrared–imaging three-quarters of a billion galaxies, stars and asteroids. It is also evidence that our galaxy did not experience major merging events since the bulge formed. If it had, interactions with other galaxies would have disrupted its shape. Lang’s analysis was originally intended to aid in his research in mapping the web of galaxies beyond the Milky Way Galaxy. To help explore the maps he’d developed from the WISE data, he created an interactive map-browsing website and tweeted an image of the entire sky. The results appear in the July issue of the Astronomical Journal. The lead author is Melissa Ness, a postdoctoral researcher at the Max Planck Institute for Astronomy in Heidelberg.